This is another pattern, the bumblebee mimics. This one is NOT Eristalis (Eoseristalis) anthophorina; evolution has done a great job but the fly-type antennae show its real identity. 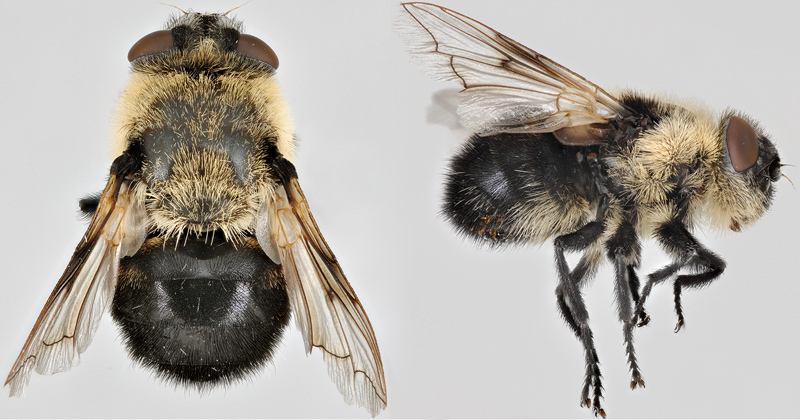 A very nice photo of a splendid bee mimic, NU. But it is not a hover fly (also called flower flies, family Syrphidae), it is a bot fly -- of the genus Cephenemyia, family Oestridae. These bot flies are parasites of deer, elk, moose, etc., where they live in the respiratory tracks of their hosts. However, I interpreted that wing fold as a spurious vein, and was suspicious about the flat face. Perhaps even more embarrassing is that I just checked my collection, 17 specimens of E. anthophorina of which 3 are actually Cephenemyia sp. You're welcome NU. Sorry to be picky -- but it was my job for several decades to identify pest fruit flies (Med fly, etc.) for the state of Calif. -- so being picky was important (couldn't have the state spend millions of $$ eradicating the wrong fly!). Aha! A pest expert! Eric, can I get you to take a look at Business end of a Western Cherry Fruit Fly and check my ID on that beast? NU, mistakes happen. I for one find it quite reassuring that even the pros get faked out from time to time! For a more impressive performance try it with male Yellowjackets - but be "sensored" (began with a d and ended with an n and the 2 middle letters were a and m) sure you have a male.